The Walkie Talkie has been named the ugliest British structure completed in the last 12 months, but there are reasons beyond aesthetics to dislike it. To say that London’s Walkie Talkie building has had a seriously rough ride since opening last August is an understatement. In addition, the building’s overall concave design has been charged with creating a down draft powerful enough to knock people over. Its successful grant of planning permission also became in itself a public scandal, given that the planner’s report warned that it would cause “significant visual harm.” And now, to cap it all, the U.K.’s Carbuncle Cup Awards have named the tower the ugliest British building completed in the last 12 months. Right now, it seems like the Walkie Talkie doesn’t have any lower to go. The Carbuncle Cup Awards, granted by Building Design magazine, may sound like yet another bit of lightweight, headline-grabbing fun. The issue of building aesthetics is nonetheless a central one in British popular debate. The term carbuncle, after all, refers back to a 1980s speech criticizing contemporary architecture by none other than Prince Charles, one that, remarkably, succeeded in substantially reshaping British planning priorities in the following decades. This year, there’s also a good deal of weight behind the award’s condemnation. Because while it may be overbearing, there are actually worse things to dislike about the Walkie Talkie than its aesthetics. Certainly, the tower’s bulbous, top-heavy bulk makes it hang oppressively over the surrounding streets and nearby river. It doesn’t in fact resemble a walkie-talkie—it’s not boxy and has nothing resembling an antenna. Its silhouette has perhaps been more accurately described as like a “sanitary towel” (aka a sanitary napkin or maxi pad), swollen at the top to favor high-rent upper floor views. But while the tower may feel intrusive, public opinion of buildings recognized instantly as eyesores does tend to soften over time. One day, Londoners might feasibly get to like this clunky stub of a building, though that in itself may not be proof of quality. What’s far more egregious is the murky, dishonest way it arrived on London’s skyline. Had Londoners known what they were actually getting, there’s no way the Walkie Talkie would have ever been built. The hinge on which the tower’s now regretted approval swung was its sky garden. It may only consist of the tower’s top three floors, but this bit of greenwashing was the Walkie Talkie’s trump card—a lush new public space that would supposedly compensate for the tower’s visual intrusion. Billed as a vertical park packed with ferns and mature trees and offering stunning views across London’s increasingly eventful skyline, it was supposed to swell the city’s collection of public spaces with something both stunning and accessible. When the final garden appeared, however, it turned out to be a collection of expensive restaurants and bars with a little bit of public space squeezed around. Given that non-diners need to pre-book to enter, it isn’t even particularly public. 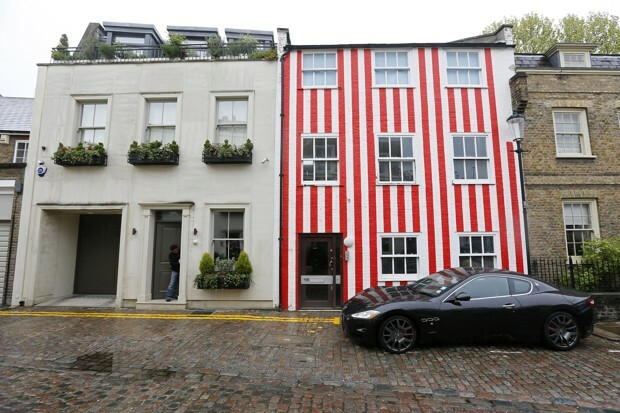 How a brightly striped Kensington mews house became the talk of the town. In some ways, the garden is a perfect reflection of the direction Britain’s capital is taking. In contemporary London, a “public” garden can now mean a tiny, embattled private space squeezed between luxury businesses, to which access is controlled by a phalanx of security. If Londoners were prepared to turn a blind eye to the construction of a fugly new tower, it wasn’t for the sake of a shiny corporate entertainment venue into which they were only grudgingly suffered to step. Stung by public criticism, it seems that city planners may actually do something about the sky garden. This summer the City of London Corporation said it was considering ordering a major overhaul of the space to make it closer to the version they actually approved. But when it comes to saving the building’s reputation, this is still too little, too late. While the Walkie Talkie’s architect, Rafael Viñoly, has not come out well, most ire has been reserved for the planners who let it slip through. No one is yet giving up on London architecture entirely, of course. This still wonderful city remains a treasure house where some good new buildings continue to be constructed. This year’s London winners of the RIBA Awards show this, even if the panel slipped up by including the egregious Neo Bankside. Still, there’s no denying the city is getting a reputation for brassy, trashy architectural follies that put private greed before public gain. Developers may care little about the effect this has on ordinary Londoners, but it’s also damaging a vital currency in which they trade: London’s brand.